Twitter integration is pretty deep throughout OS X and iOS with the sharing abilities and various uses of Siri, but another often overlooked Twitter feature is part of Safari and called “Shared Links”. 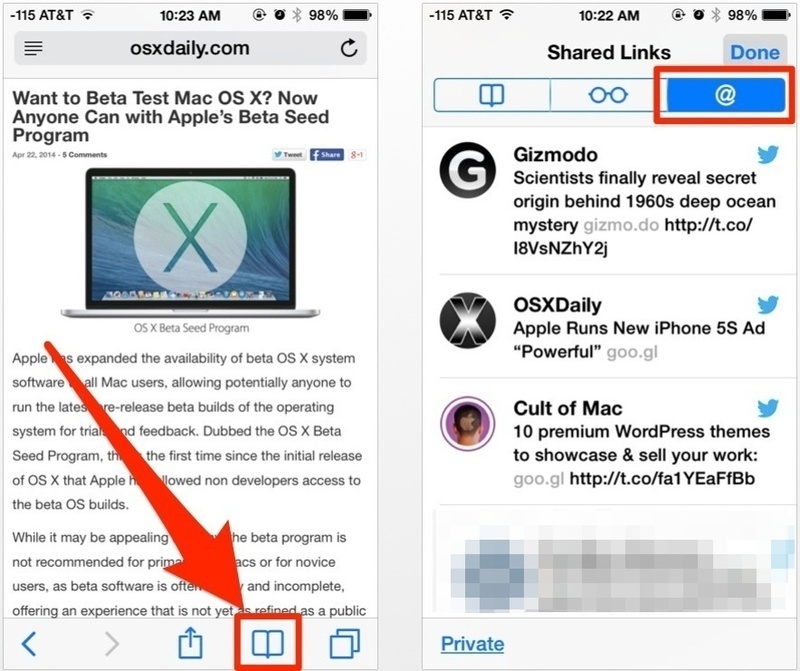 Put simply, Shared Links can be thought of as an extension of the handy Reading List feature of iOS and OS X, except that it offers an easy way to see what links are being shared by who you follow on Twitter. This can be offer a great way to keep on top of the news or whatever other topic interests you, without having to download additional reader apps onto the iPhone or iPad. To get the most out of the Shared Links feature in Safari, you’ll want to have a fairly well crafted Twitter follow list (starting with @OSXDaily of course) that tweets the type of information you want to read about. That means following accounts that send out tweets about topics of interest, whether it’s comedy, news, economics, tech, astrophysics, sports, you name it. None of the standard Twitter messages will appear in this Shared Links, only tweets that contain links will show up. This is why it’s important to follow the right accounts, otherwise you’ll find the @ shared stream to be either boring or overwhelming. If you find the list of Shared Links to be too noisy, you may want to cut down who you follow and limit it to only things that interest you to actually read about. That’s particularly good advice for the many of us who use Twitter mostly as a consumer of news and info rather than as a very active participant, tweeting every crumb of breakfast out to the world. For some users this can even serve as a replacement to an RSS reader for the iPhone or iPad since it will automatically gather shared links for you in a similar manner, but again that’s really a matter of following the right accounts.